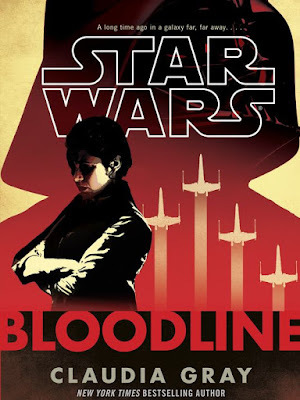 USA Today released the first preview for the upcoming novel Star Wars: Bloodline by Claudia Gray (Star Wars: Lost Stars), which takes place six years before the events of The Force Awakens. The novel, which hits shelves on May 3rd, will focus on Leia Organa. USA Today also chatted with Gray about what we can expect from the novel. According to Gray, "this novel isn't fundamentally about Leia as a wife, sister or mom; this is about the role she's created for herself since the fall of the Empire, and the one she takes up by the time of (The Force Awakens)." She also talker about the novel's cover (above), also revealed by USA Today. Gray said, "I find myself remembering the Episode I posters, where you see the boy Anakin with Vader's shadow stretching out behind him. In this book, we find out just how far Vader's shadow falls." The conference building of the New Republic senatorial complex contained multiple rooms appropriate for every kind of auxiliary function imaginable, from memorial concerts to awards ceremonies. Leia Organa and Tai-Lin Garr headed toward one of the smallest banquet rooms. The breakfast meeting had been organized by Varish Vicly, who couldn’t imagine a bad time for a party. “We’re still early,” Leia protested as both she and Tai-Lin were wrapped in quick, long-limbed hugs. “Now come along and be introduced to everyone,” Varish insisted. Soon Leia found herself shaking hands and paws, murmuring greetings; thanks to some review holos Korr Sella had prepared for her, she recognized each senator in attendance and could even ask a few pertinent questions about their families and worlds. They entered the banquet hall together, the entire group walking two by two. Leia knew the seat at the far end of the table would be hers, guest of honor as counterpart to the host. So she walked the length of the room, attentive to the senator at her side, before glancing down at the arrangements — sumptuous even by Varish’s standards, with a velvet runner stretching along the table and delicate paper streamers lying across the tables, beneath elaborately folded napkins. Leia had to laugh. “Honestly, Varish. For breakfast?” In other words, Leia thought as she listened to someone cheerfully talk about his grandchildren, this is going wonderfully for everyone but me. Star Wars: Bloodline by Claudia Gray hits shelves on May 3rd. Ben's Fall could have happened a lot closer to TFA then most people think, and I believe that Pablo Hidalgo stated that much.